Home > Uncategorized	> Not superficial? The implications could be staggering. Not superficial? The implications could be staggering. Left: the arrow points to a THREAD that is displaying a cut edge, i.e. much needed transverse section. Why the speckled appearance? Right: enlargement, showing that it’s the SCW cores of some but not all individual FIBRES that contain the dense pigment, probably Maillard-derived melanoidin, the latter possibly having penetrated via this investigator’s proposed reticular network of capillary channels existing between the MICROFIBRILS. If Colin Berry is right, the implications could be staggering. It’s enough, I thought, to warrant waking up this blog for at least one posting. Your comments are, as always, welcome. I retired from blogging just over three years ago. Until today, I stayed away from this blog and every other Shroud of Turin related website and newsletter. A few days ago, I decided to jump back in, at least for one posting. That was after getting an email from Dr. Colin Berry. He wanted me to know that he now suspected that the Shroud’s image is not superficial. Not superficial? But Isn’t it a fact that it is? Isn’t it something we all believe is true? No, not on the surface PCW (primary cell wall) but hidden away, out of sight, deep within the microfibril-packed core of the SCW (secondary cell wall). Oh dear: has sindonology got it entirely wrong with its ‘out-of-this-world ultra superficial’ body image? Colin’s email to me invited me to look at his blog. Colin tried to boil the ocean in his last posting, something that I used to do myself, sometimes. I would do so again, this time in a reply to him. In addition to my reaction to Colin’s non-superficiality grenade, I had three years of pent up thinking to unload. When I realized my reply was too long to be a reasonable blog posting or email, I turned it into a PDF file called,The Resurrection is Just Too Mysterious to Be Described & A Response to Dr. Colin Berry. Long walks with the dog, away from the blog, gave me the chance to think a lot about the Shroud. Colin and I are closer than I thought we were. It is mostly in the conclusions about the authenticity of the cloth that I disagree with him. I think we are very much in agreement about not finding any basis for an image being created as the result of the Resurrection. Unlike ordinary photographs or paintings, the Shroud image converted into an undistorted three-dimensional figure, a phenomenon which suggested that the image-forming process acted uniformly through space over the body, front and back, and did not depend on contact of cloth with body at every point. Unfortunately, that wasn’t true. At an international Shroud of Turin conference in St. Louis in 2014, Joseph Accetta proposed that a photograph of a certain death mask might contain all the information needed in exactly the same way as the image on the Turin Shroud. He was right; Colin did so and confirmed it. That challenged the belief, stemming out of an erroneous assumption that the grayscale values on the Shroud represented cloth-to-body distance or body shape. It was a classic case of an assumption being treated like a fact. See: It is really, really time to rethink what we think about 3D. Colin is a scientist. If he is wrong about the non-superficiality of the Shroud image he certainly wants to know it. And he wants to know why. And if he’s right he wants you to know. And I want you to know that this might challenge a generation of postulating about how the image was formed. Also, read Colin’s blog posting at Shroud of Turin Without All The Hype. Comments are certainly welcome there as they are here. No disrespect intended, but if Colin Berry wrote this, then I will ignore it. This man has not an inkling of integrity. He doesn’t like the Shroud and apparently doesn’t like that there is little opinion and no evidence to demonstrate anything except the Shroud is authentic. What is the point is discussing anything with him? Here’s a link to deacon Andy’s “Shroud Exhibit and Museum” based in Alamogordo. I shall say no more, preferring debate of the hard facts to slanging matches, especially as each us is restricted to experimental models (myself) and facsimile replicas respectively. Thanks Colin. Good luck with your research. Our website direct link is http://ShroudNM.com. I am not convinced why this experiment by Colin is claimed to be so significant. I cannot follow his reasoning. As far as i understand, he postulates, that some reagent in powder can color the surface of flax fibers. Possibly, but I don’t understand how it relates to postulated Shroud superficiality. The term “superficial” is hardly precise, it is considered a fact, that the image on the Shroud is superficial, that is the colorization does not penetrate the inside of the fibers. But how deep does it penetrate -it is not exactly specified. On the order of light wavelengths ~100s nm. What exactly causes this colorization -it is still debated, Colin’s claim is just one another hypothesis. I understand the scepticism as regards my Model 10 . How can something so downmarket as an oil-assisted flour imprint of a real human body onto linen, held over medieval glowing embers (e.g. charcoal fire) then washed with soap and water, possibly produce a final image that matches the subtlety of the body image on the TS? But it does. I’ve just this minute taken paper and pencil and listed 17 matching characteristics no less. (I’ll provide a detailed list if anyone’s interested). 17 matches to an image as ‘ enigmatic’ as that of the TS body image is surely no coincidence. The ultimate test of the scientific method is to make a prediction, based on one or more hypotheses that have withstood falsification. OK. I’m now able and ready, after some 7 years of model-building and testing (1 through to 10) to make a head-on-block prediction. The TS body image fibres, viewed in cross-section (or mere cut ends of threads for those without a microtome) will show penetration of colour into the cores of the secondary cell walls of individual fibres. In other words the image is not, repeat NOT, confined to the outermost primary cell walls, a claim that has been deployed time and time again to argue in favour of some kind of ‘resurrectional selfie’ image-capture via supernaturally-assisted ‘photography’. II’s time, nay long-overdue, for the “image ultra-superficiality” mantra to be put to the test, not merely intoned as if proven fact (which it’s not!). I may be able to raise that to 99.9% once I’ve performed fragility/brittleness tests on image fibres, a crucial test (no.18!) thus far postponed while I ponder how best to perform. Do you have relevant pictures of TS -stress it, TS, not some other linen, showing this? I’ve spent the last 7 years trying to track down such transverse sections, putting out feelers here there and everywhere, totally without success. My position now is that anyone in possession of a TS image fibre, e.g. a leftover from 1978 or 88, should slice it in half and view the cut ends under a high power microscope, with powerful illumination from beneath. I predict (admittedly based entirely on my latest 2015-vintage Model 10- flour imprinting) they will see the cross-section of the thread, with its 200 or so separate fibres,populated by fibres (just some,not all) that have image colour that penetrates the SCW cores. No, the pigment will not be confined to the ultra-thin PCW sheath, repeatedly stated as if proven fact. It’s not my job to produce evidence that does not exist. It’s for proponents of the “PCW-only” mantra to provide the hard data that convinces the science-based sceptics like myself! If there’s anyone out there in possession of the crucial and much-needed supporting PCW-only data, then kindly produce it – or provide a link to where it can be seen and inspected. So far, there is no way to check your prediction, on your specified condition, unless you persuade the current owner of the samples (Fanti, or whoever else -contact them!) to do it for you. How great to see a new posting by Dan! Reminds me of the “good old days.” I really enjoyed reading his response to C.B. The points about the physical vs. the spiritual nature of the Resurrection are especially very pertinent. I’ve often wondered what a video camera would have captured. My guess is it probably would have just malfunctioned! I do believe that the Resurrection and the Shroud, each tremendous mysteries in and of themselves, are inextricably intertwined. It’s amazing to think of all the ink used for both. And there is no doubt that both will continue to be speculated on indefinitely. Thanks, Dan for that thought-provoking piece and for posting it on the blog! I have been in contact with Prof. Giulio Fanti at Padua University (one of 9 supplied a week or two ago with a tip-off regarding my latest microscopy) and had a useful, potentially fruitful exchange. That’s all I’m prepared to say for now. Wow! Glad to see you’re back, Dan, if only sporadically! I think your pdf is wonderful, and should be more widely read than in merely sindonological circles. Most thought provoking and inspiring; thank you. However, to business. There are several micrographs of image fibres around the internet, notably by Ray Rogers and Giulio Fanti, and in none of them is it really obvious where the colour lies. There are vanishingly few direct comparisons between image and non-image fibres (side by side; same slide, same imaging conditions), so everyone has been able to come up with their own definition of superficiality. Significantly, the early findings of the STuRP team do not illustrate a detailed knowledge of flax fibres. Neither the PCW nor the SCW is delineated, and the central empty tube is consistently referred to as a medulla, which is a feature of animal, not botanical filaments. They seem largely to think of flax fibres as uniform cylinders of amorphous cellulose, with a hole through the middle. Heller and Adler thought the image was etched on the outside of this cylinder. They might agree that they mean that the PCW is etched (‘corroded’ is their word, I think). However, almost all the SEM photos of image fibres show material added on rather than removed, either in particulate form, with little speckles and strands dotted about, or continuously, like a solidified glutinous cream. Rogers thought that the fibres were coated with something which was stripped off by his tape, leaving pristine fibres beneath, while I think Fanti believes this to be the PCW. How easy it is to remove the PCW neatly from the SCW I don’t know. If, however, the colour is within the much thicker SCW, I can’t help thinking we should see some little twists of darkness on the micrographs, which I don’t see. I shall be interested to read other researchers’ takes on this. If the colour is within the SCW, then a simple transverse section of an image fibre should show this. One should not have to go looking for clues in micrographs of intact image fibres, viewed from the side, not if there’s a simple conventional means of distinguishing between what’s exterior, what’s interior i.e. the cross-section. I strongly suspect those TS sections were never taken. Or, if they were, they were never published. If, as I suspect there is no cross-section of TS image fibres in the literature, despite the simplicity of performing that elementary exercise, then given the constant intoning of the “PCW only”mantra ,a basis, nay shoddy pretext for invoking supernatural intervention, we are looking at a major failing on the part of so-called “science-based” sindonology, one in which STURP, SSG etc must take a major share of the blame. I don’t think I’m getting bogged down in verbiage, I think the distinction is crucial. The image on the Shroud is not seen by peering at transverse sections, it is seen by looking at fibres lying horizontally. If the image is indeed threaded through the SCW, then it must be bold enough to be visible through the PCW (is it completely transparent? ), or, if an individual fibre does not carry enough ‘colour’, then there must be a sufficient depth of fibres lying on top of one another for enough to be observable. Sorry, Hugh, but we are poles apart on this. Firstly, it’s not perception of the overall image that is the issue (especially as we are told one needs to stand back a metre of two merely to recognize the image). It’s the question of chromophore colour, and where it’s located within individual image fibres, i.e. close up, under the microscope. Then there’s the assumption that the PCW is “transparent”. Evidence? Who’s to say it’s not mirror-like, the opposite of transparent? Linen is noted for its lustre. Who’s to say that is not a manifestation of its component fibres reflecting light, rather than letting it pass through unhindered? Pleasel, let’s stop procrastinating, let’s stop beating about the bush. Taking transverse sections of TS linen fibres should have been an elementary first step, especially as they require next to no fabric to perform. Where are those transverse sections? Do they exist in one or other archive or not? If they do, they should be released immediately. If not, they should be done immediately, even if it means excising a few more threads or even individual fibres from the Turin Shroud. The obscurantist nonsense re PCW versus SCW has gone on for far too long. I’m afraid you’ve lost me somewhere along the line. “Firstly, it’s not perception of the overall image that is the issue.” Well, yes it is. The image is differently coloured from the background. The fibres in the area where there is image, either individually or collectively, must have a colour that can be seen. “Then there’s the assumption that the PCW is “transparent”. Evidence?” Easy. If the image colour resides only in the SCW, and the PCW does not let the image colour through, then you wouldn’t see the image at all. “Who’s to say it’s not mirror-like, the opposite of transparent?” Well, me, for a start. If linen fibres had mirror-like surfaces, then the entire cloth would shimmer and sparkle in the light shone on it. Which it doesn’t. “Who’s to say that [linen’s lustre] not a manifestation of its component fibres reflecting light?” I think the lustre of linen is exactly that. But what I want to know is, how can I see an image on it? I think good transverse sections would be an excellent idea, but they are only aids to understanding how we see an image on the Shroud. And the image on the Shroud is not observed through transverse sections, but straight on. Procrastinating? About what? Beating about what bush? I have no idea to whom you are addressing this plea, or what you think they ought to do about it. Heller? Adler? The STuRP team in general? I’m afraid they’re mostly dead. The Pope? I’m not sure he’s too bothered one way or another. I doubt if he’s lying in bed procrastinating about it, and he’s certainly not beating about any bushes. So, if the image resides in the SCW, then discolouration should be visible looking at the fibres straight-on, even if it is considerably more visible end-on. Here’s a photomicrograph from my own site – posted today in fact. Note the many image fibres (Model 10) where the colour is (a) observable mainly or exclusively at the cut ends (b) absent, or nearly so in the side view of fibres leading up to the cut ends. Correction: apparently absent. Reflection of intense white light may well prevent one seeing a modest degree of faint yellow chromophore-supplied coloration. I believe this single image can tell us a lot about the visibility or otherwise of TS image fibres where the image colour is mainly, but not exclusively confined to the SCW (NOT exclusively the PCW as we are repeatedly asked to take on trust, together with the supernaturalist baggage that comes with it). But a single photomicrograph cannot be expected to tell the whole story where image visibility is concerned. What may be visible at a distance with the naked eye under relatively weak light may be different to what is visible under a microscope at high magnification and intense illumination. There’s been too much premature entrenchment of opinion based on scanty or non-existent data. Yes, it’s objective non-partisan data that are needed right now, starting with transverse sections of image fibres, viewed under different light intensities, from above and below. The apparent unavailability of that essential groundwork data is to my mind nothing short of a scandal, given the vast number of publications in the ‘refereed’ ‘peer-reviewed’ literature. I believe future historians will judge sindonology harshly – and rightly so.. I have now said all I want to say, and will now take my leave. Thank you Dan for flagging up my current thinking and experimentation. superficiality were revealed by STURP through high-powered microscopic examination (32X and 64X magnification) and in transmitted light photographs that allow comparison of the faint image to the much darker fire-related scorches found on the Shroud. 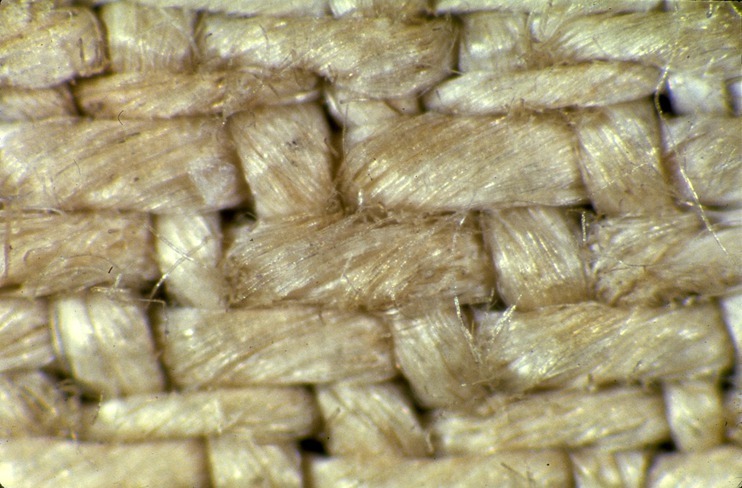 At the thread level only the surface linen fibers bear the yellow-brown color of the image. Catch the last sentence, above, in the part I have quoted. So characteristic 2 is just a maybe. Can Dr Berry see those 64x pics? I’d like his interpretation. Did XTURP pick out the 17? It’s interesting to compare Jackson’s list of evidence with Fanti’s (Hypotheses Regarding the Formation of the Body Image on the Shroud of Turin: A Critical Compendium, combined with a List of Evidences of the Turin Shroud). The most fascinating parts of both are their summaries of how well the evidence supports their own pet theories about image formation, and how poorly it supports the other’s, and Ray Rogers’s. Fanti compares 24 characteristics against 12 hypotheses, and finds that only his own Coronal Discharge hypothesis accounts for all 24. He finds that Jackson’s Fall-Through hypothesis only accounts for 19. On the other hand Jackson compares 17 characteristics against 10 hypotheses, and finds that only his own Fall-Through hypothesis accounts for all 17, while Fanti’s Coronal Discharge only accounts for 12. Rogers’s hypothesis accounts for a mere 63% of Fanti’s, and 53% of Jackson’s, while Rogers himself rejected both their ‘radiation’ hypotheses conclusively on microscopic evidence. Apart from a few generally accepted ‘facts’, both lists soon collapse into arbitrary statements of belief such as “the Shroud wrapped a dead body”. Jackson’s, in particular, is rooted in the assumption of authenticity. ps. Shameless plug. Have you seen my academia.edu papers, The Medieval Shroud and The Medieval Shroud 2? You are quite correct that the Shroud is somewhat overspecified for a fake shroud of Christ. Indeed, the fact that it has a figure on it has been used as ‘proof’ that it cannot be Christ’s burial cloth for many centuries. However, there are several other possibilities whereby the double image on the cloth could have been useful in the Middle Ages, and the Shroud may well have been made for a different purpose. Having said that, the actual manufacture of the image was probably quite simple. Smear a bas relief with something (there are several workable suggestions) and lay the cloth on top. Either some pigment, if there is pigment, or a reaction of the mixture and the linen fibres, forming some kind of chemical scorch, could produce an image of similar resolution. Sadly the examination of a few fibres extracted from the surface has not been sufficient to determine the method more accurately. What the image is definitely not made of is blood. There is blood on the Shroud, and as you suggest it would, it has penetrated the tissue and is clearly present on the back surface. It is the image which is superficial. When you say “even an unknown source of radiation would have penetrated deeper,” you miss your own point – both the source and the type of radiation being unknown, you could hardly claim you knew how it would behave. In fact Paolo di Lazzaro has identified, with considerable precision, radiation which does not penetrate the threads at all. And as for “the existing body disintegrated and crossed the fabric as if it did not exist,” I’m afraid I don’t think it did. I wonder why you should think that? The controversy on the shroud has existed since the earliest accounts of its existence. Even with all knowledge and technology we have today, there is not a definitive answer to what this enigmatic object really is. The hypotheses of production by human hands are mutually exclusive and conflict with one another, since no one has yet succeeded in exact replicating it with the numerous existing theories. Producing partial images that resemble the shroud is very easy. The problem exists in representing a whole body frontally and dorsally without significant distortions and, moreover, exact in relation to the injuries that a tortured body would suffer requiring knowledge of anatomy, physiology and pathology, missing in the middle ages. One should always avoid being too dogmatic on this topic. Much of what you say is correct, but it is not evident to me that any better knowledge of human biology was required than that commonly known by artists of the 13th century. You go on to announce that “It is impossible to reproduce a shroud like image through painting or using a real body.” I wonder how you know that. Various people in various ways have produced images which are certainly shroud-like, if not entirely identical, and if we had a better idea of what we were attempting to reproduce, no doubt we could achieve a closer resemblance. If you have a new hypothesis, do feel free to share it. Both authenticists and non-authenticists will be interested, and neither will say that it has to be proved. All it has to do is to fit the evidence as we know it so far. It is hilarious to think that in the Middle Ages the forensic medical knowledge and all the physiology that occurs in polytraumatized human bodies, they were known as today we do. Blood circulation, for example, was only discovered in the 17th century by Harwey. The supposed author of the image on the shroud would need to crucify a living man after tortured him in the same manner as described in the scriptures, including the postmortem lance wound, to minutely observe the dynamics of these lesions and to reproduce it in some way, on a linen cloth. Not to mention that the dissection of corpses was forbidden by the Christian religion in those times, and such an attitude would hardly go unnoticed by those people close to this extremely skilled craftsman. Besides, we must add the extreme luck that he would have to success already in the first attempt. Simply surreal!!! I’m afraid I can’t agree about your first point. People of the Middle Ages were familiar with blood flows, and could copy them. There was no need to know what was going on inside the body, nor the precise mechanism of crucifixion. There is much to suggest that a real scourging and crucifixion would have left rather different marks than those so clearly delineated on the Shroud anyway. As to your second point, apart from the over-confidence of suggesting that the image could “only” have been formed in the way you describe, you are as entitled to your hypotheses of the physics of miracles as anyone else. If God had required anti-gravity fields and material disintegration and teleportation, I’m sure he could have arranged them as you describe. Now, unfortunately, I enter in this debate (about the superficiality in the Image, the degree of penetration, etc.) with a very late message… Sorry. the nanotomography of very few linen fibrils involved in BIF (Body Image Formation) and the inherent useful studies. “An instrumental approach to combining confocal microspectroscopy and 3D scanning probe nanotomography”, Mochalov KE and other researchers, Ultramicroscopy. 2017 Nov;182:118-123. Epub 2017 Jun 21. >The combination of SPM and ultramicrotomy (scanning probe nanotomography) is very appropriate for characterization of soft multicompound nanostructurized materials, such as polymer matrices and microstructures doped with different types of nanoparticles … … and biological materials … …. The combination of scanning probe microscopy (SPM), which provides data on not only the topography, but also the spatial distribution of a wide range of physical properties (elasticity, conductivity, etc. ), with ultramicrotomy, allowing 3D multiparametric examination of materials, permits to enlight our problem. I did follow all the interventions and I did observe how in the last interventions you seem going very far from the resolution of the problems. I would also like to add that (although I am not very much in favor of using HRTEM) it seems strange to me that the HRTEM technique (see for example the paper by E. Carlino, G. Fanti and other researchers, 2017) was not used to observe linen fibrils and the level of penetration of the chromophore. In other words: I think it is possible to show the truth about the BIF using the Scanning Probe Nanotomography. If I well remember, the late researcher Ray Schneider approved this idea of mine. What is your opinion on that rough “SPN idea” ? Here’s an experiment I hope to try soon, once I’ve laid hands on the two essential components (I’m flagging up intentions now so folk can know the way my thoughts are going, already hinted at in comments on this posting). The chief components (thus far none in the house)? White balloons (preferably sausage shaped) and smokers’ pipe cleaners (the fluffy sort with a bendy wire down the middle). The balloon will represent the PCW, and the pipe-cleaners, placed inside the balloon before inflating, the largely cellulose microfibrils). White pipe cleaners inside the inflated balloon will be a reference control, albeit a boring one, probably showing nothing worth seeing. But suppose one took several pipe cleaners, then coloured up just one, say with paint or dye, to make it yellow, and then inserted it into a bundle of uncoloured ones, with or without twisting the bundle (probably better with twisting to reproduce the alleged helical as well as longitudinal manner in which microfibrils are arranged within linen fibres, to say nothing of keeping the ‘microfibrils’ bundled up together .). Place the pipe cleaner bundle with coloured ‘strands’ here and there inside the balloon, inflate, then stand back and observe, with or without a bright light source. Can one spot the discrete coloured ‘strand(s)’ through the “PCW”, or is there maybe just a diffuse honey-coloured appearance that fills most of all the interior of the balloon. If not, try smearing Vaseline over the outside of the balloon (or even inside?) so as to render if more reflective to light (either reflected light or tramsmitted light that has come through the balloon from the opposite side from the viewer. In short, can one model a coloration that is faint and diffuse, despite originating from dense pigmentation that originates in (more correctly around*) one or more “microfibrils’ (pipe cleaners)? Might the model help drive home the need to view cut ends of Turin linen fibres to be certain of what’s where, and not go jumping to premature conclusions based on naked eye only or partial micrsoscopy that is still an external view only, prone to all kind of ‘tricks of the light’? *There’s a variant on the above model that also needs testing if to better represent my Model 10. Instead of colouring an entire pipe-cleaner, just run some colour between two or three of them, so as to model colour occupying inter-microfibrillar spaces/capillary channels, as distinct from the microfibril itself. But that’s just a minor detail where initial modelling is concerned. If I understand Colin correctly, the main point about the image residing in the SCW rather than the PCW is that the SCW is easier to degrade, and can enable the products of such degradation to flow between the microfibrils. This makes excellent sense – except that according to Giulio Fanti the PCW is easier to degrade than the SCW, because it contains “polysaccharides of lower activation energy” than the cellulose of the SCW. Heller and Adler recorded degradation of the outside of the fibres (which must include the PCW), and Ray Rogers observed a stripped-off layer, which he claimed was an impurity layer of starch and Giulio Fanti thinks was the PCW. A photo in one of Giulio’s papers (Fig. 12 of ‘Microscopic and Macroscopic Characteristics of the Shroud of Turin Image Superficiality’) shows a broken fibre, from which some of the PCW, quite deeply coloured, has cracked off leaving a very pale, uncoloured, area of SCW beneath. Which of Colin’s and Fanti’s explanation of the colour is correct could be determined by a cross-section of the fibres, as Colin has attempted. If he is right, the cross-section should show dark centre surrounded by a thin uncoloured border, and if Fanti is right, it should show a thin circle of dark colour surrounding a pale centre. Although Colin’s cross-sectional photos are not really clear enough, they certainly seem to support his hypothesis. However, they were produced using his own method of image-production. It may be that the Shroud itself is different. If it is found that the Shroud fibres are dark on the outside but light on the inside, while Colin’s fibres are dark on the inside but light on the outside, the the conclusion must be drawn that Colin’s method of producing coloured fibres was not the way the Shroud image was produced. Have just posted these two images to my own site (main posting plus comments) with the very first result from the balloon/pipe cleaner experiment. Yup, modelling of an SCW-localised chromophore creating a false impression of an image that is so hard to discern, even under the microscope, viewed side-on, that it must surely – we are told – be ultra-superficial ( confined to PCW only, cue resurrectional photography, cue endless outpouring of pseudoscience – radiation, corona discharges etc etc, even via peer-reviewed journals). Marvellous! Very entertaining – but see my post above. Just because the image could reside in the SCW does not necessarily mean that it does. Is there a good reason for rejecting the PCW, rather than simply coming up with another possibility? Apols for keeping brief my reply to Hugh and his ever growing list of reservations and objections expressed on this site (not all of which i comprehend, especially the one earlier about “degradation” which leaves me totally nonplussed). Frankly I see no alternative post the unsatisfactory STURP initiative (which yielded next to no useful information as regards the chemical nature of the image chromophore, much less mechanism of formation) than systematic model building (plus model refinement, plus intermittent model rejection etc). Hopefully an opportunity will come one day to test various folk’s models (or mere hunches) on another tranche of Turin fibres, hopefully without the sticky tape next time! Model building requires than no stone that one encounters be left unturned. Never mind the appearance of the stone itself – which may or may not be pretty in its own right – usually not. It’s what might be hidden underneath that matters. Anyway, thanks Dan for spotlighting my finding with the cut-edges on Model 10. One doesn’t have to buy into my Model 10 and its accompaniments (“simulated sweat imprint”, partial agreement with Rogers, total rejection of the ‘radiationists’ and their supernatural photography) to accept that we now have a new possibility to consider, namely that the TS body image may not be as superficial as claimed. There could be dense pigmentation hidden away inside the SCW: the initially oh-so-plausible PCW-only location appears to be based more on negative than positive evidence (“if it ain’t immediately visible then it must ipso facto be ultra-superficial on the surface”). In deed, one could go further and suggest it’s based less on negative evidence, more on zero evidence! I’ll respond from now on to Hugh and his various points, genteel sniping an’all, on my own site if it’s all the same to him. Re-reading the comments here, Dan, a thought has just come to me. Would you be willing to add the following image to the body of your posting? It’s one of Mark Evans’s photomicrographs of image fibres from the Turin Linen (ME-16, x24 mag, taken from the Mario Latendresse’s sindonology.org site). Then ask readers to say how they would be able to know for certain the location of the image chromophore – PCW or SCW – from this picture alone, without taking a cross-section? Some here maintain that the onus is on the sceptic to prove the chromophore is not exclusive to the PCW..
Not so. The onus is on those who maintain the body image to be exclusive to the PCW to provide hard evidence. Cross-sections of Turin image fibres must surely be an essential first step. Without them, one can conclude nothing about superficiality, at least not from the Mark Evans picture provided. I am now minded to think that the multi-author Fanti et al 2010 SSG review flagged up earlier on this thread by “OK” should be retracted, preferably by its authors, or failing that its journal publishers. The crucial section (Superficiality at fiber level) contributes nothing new to the question of chromophore location, and indeed one of its so-called references is in fact a padded-out footnote if the truth be told. It merely substitutes the PCW for Rogers’ largely undocumented ‘starch impurity layer’ – which is not science, more horticulture (prune and graft). I’m willing to supply Dan a fulsome critique of that hugely misleading paper if he wishes. I have to say I’m confused. In his conviction that his new hypothesis must be correct, Colin has wandered so far away from normal scientific procedure, not to mention accuracy, as to lose coherence. He seems to think that, because the superficiality of the Shroud image cannot be determined by one of Mark Evans’s micrographs, that itself is some kind of proof that he must be right and everybody else must be wrong, and demands that he be proved wrong before the previous hypothesis can be entertained. This is not how science works. Furthermore, he seems to think (from earlier posts) that the superficiality of the image was largely a guess, or an assumption based on faith rather than observation and experiment. This is wholly untrue. 1) In their “Chemical Investigation” paper, Heller and Adler attempt to identify the image chromophore. They observe of the “yellow fibrils” of “body image, (non-blood) areas” that “Surfaces appear corroded under phase contrast”. They are distinguished from the “pale yellow fibrils” of “non-image areas”, where “Surfaces appear slightly corroded under phase contrast”. By experiment, they observe that the more corroded the appearance of a fibre, the stronger the reaction in a Schiff test for aldehydes (among others). This implied, to them, that the image was due to the dehydration and oxidation of a cellulose component of the fibre. From the word “corroded” I infer that they imply that the image affects the surface of a fibre, but as they do not seem to distinguish between the PCW, SCW or any other component, they do not claim extreme superficiality. 2) In his “Microscopic and Macroscopic Characteristics” paper, Giulio Fanti reproduces several microscopic images of image fibres from the Shroud, which appear to show the PCW peeled away from the SCW, and the PCW being darker in colour than the exposed SCW. He also shows a single slide with both image and non-image fibres, the non-image fibre being almost colourless beside the image fibre. From these observations, he concludes that the image resides in the PCW, and not in the SCW. These conclusions may be incorrect, but they are not assumption-based, nor guesses. In highlighting a summary section which Colin claims contains “contributes nothing new to the question of chromophore location”, he seems to ignore its references to the micrographs, which were indeed both new and extremely informative. So, here are two papers, with detailed observations, experimental results and conclusions, explaining why, in the opinion of Heller, Adler and Fanti, the Shroud image resides on the surface of the fibres. Contrary to Colin’s hyperbole, they do not claim that their conclusions are “a proven fact”. That’s perfectly good science. Some explanation as to why the image does not, apparently, penetrate the SCW is given by Fanti, in that the hemicellulose of the PCW is easier to degrade than the cellulose of the SCW. That’s perfectly good science too. However, good science can be completely wrong. The observations may be able to be interpreted in different ways, different experiments can give conflicting results, and alternative conclusions may be equally valid. The scientific approach to denying previous conclusions is to refute them at evidence level. Is there evidence that Heller and Adler were incorrect in their observations about “corroded” surfaces? Should their Schiff tests have been interpreted differently? Should Fanti’s photos be re-interpreted, or discarded as insufficiently clear? That’s what good scientists do. What has Colin done? Popped up with some photos of a different cloth, which appear to show a process in which the SCW has become stained. They do not show that the PCW has not become stained, as they are not clear enough to show it separately from the SCW. Nor has Colin yet demonstrated that his process is commensurate with the Turin Shroud, although no doubt his 17 points of congruence will be published shortly. Having planted his flag, he now pretends that there is no evidence for the original proposition (“It’s for proponents of the “PCW-only” mantra to provide the hard data”, and “If there’s anyone out there in possession of the crucial and much-needed supporting PCW-only data, then kindly produce it – or provide a link to where it can be seen and inspected.”). This is disingenuous. He is well aware of the papers I have mentioned above, and has seen and inspected them. If he disagrees with them, he should say where and why, rather than simply announcing to the world that he is right and they are wrong. That’s not what good scientists do. This retired scientist has no comment whatsoever to make regarding the one that precedes it. He’s concerned purely with establishing the facts, and pointing out where key facts are missing, where unsound and highly trumpeted claims have been made without bothering to acquire those crucial facts. Lower left: the cross-section from my Model 10. showing strongly pigmented SCW cores of image fibres. Lower right : a question mark. (Where for heaven’s sake is the corresponding cross-section for the Turin Linen, maybe not whole fabric, maybe not whole thread, but surely one from a single dispensable image fibre at least? How can anyone claim that the TS body image is confined to the ultra-superficial PCW if they have never bothered to do a cross-section? I have. But then I’m a research-trained scientist, content to deal in facts and ideas. I leave the insults and browbeating to others. The answer to Colin’s rhetorical question can be found above. If he has any difficulty with the micrographical evidence upon which the “PCW-only” image hypothesis is based, he should say what it is. Nice to hear from you again and to learn that the past three years have been relatively peaceful for you. I must admit that I, too, was finding the Shroud blog a bit tedious. I remember Colin Berry who was always bringing up some silly claim about how he had managed to duplicate the Shroud image at least in part so, therefore, it could have been forged in the middle ages. I never saw a single fact in any of his postings that either cast doubt on the authenticity of the Shroud or suggested in any meaningful way how to duplicate it today. Nor do I see any significance whatsoever in this latest “discovery” regarding the Shroud image. Here’s where I stand and why I find this kind of analysis tedious and very unilluminating. The evidence for the resurrection of Jesus Christ is overwhelming without any reference to the Shroud of Turin. We routinely convict people and send them to the execution chamber on far less convincing evidence than we have in the Gospels and early Christian history. If the Gospels concerned anything but a miraculous event by a person claiming religious divinity, there would not be a single peep raised about their authenticity and historical relevance and value. But people who do not believe in God or reject the tenets of Christianity cannot accept the Gospels as true or their whole argument vanishes. So they nit and they pick and they complain and they challenge and they make up stuff that purports to show the Gospels are not factual. Perhaps the worst of this entire group is the bunch of fools known as the Jesus Seminar, of which Marcus Borg is a prominent member. This group essentially denies everything that Christianity teaches but claims to be adherents of the “spirit of Christianity.” Pardon me while I gag. The Gospels speak plainly and clearly and are obviously intended to convey facts, not the kind of philosophical pretensions that groups like the Jesus Seminar love. The people who wrote the Gospels and the early followers who lived at a time to either witness Jesus and his words and actions directly or to learn of them from people who did gave us the highest possible indication of sincerity: they let themselves be killed for the truth of their witness. The Gospels themselves have enough minor variations to prove they were not concocted as a sales job by the apostles and disciples after Jesus died. In fact, the internal evidence for the truth of the Gospels is powerful evidence of their accuracy and numerous books have been written conveying this fact. Besides the Gospels’ historical reports and St. Paul’s theological explanations in his letters, there have been countless miracles involving Christian saints and events down through the ages since the time of Christ. Again, there are books too numerous to list that detail many of these miracles. The Shroud of Turin is a generous gift by a loving God and Messiah to subsequent generations to see what his crucifixion actually looked like. For that matter, what he looked like. A picture from a time when photography did not exist and statues were not made of ordinary citizens. The 1988 carbon-14 dating that purported to show a middle ages origin for the Shroud has been thoroughly discredited by the discovery that the threads were taken from an area of the shroud that had been repaired in the 15th/16th centuries and the Hungarian Pray Codex that shows the burn holes from the Shroud at least as early as 1192. And there is plenty of other history that all points in the same direction. It is further clear to common sense that a medieval forger would not have created the faint Shroud image while hiding the exquisite and voluminous detail that would be revealed in the negative of a photograph. First, photography and its positive/negative images were unknown until the 19th century. Second, the power of the shroud is far greater with the detail shown and any forger would have included it to enhance the effect of the image on people who viewed it. How the image was formed is perhaps the most tedious of all the remaining arguments. When John Jackson and his crew examined the Shroud, it was important to determine if the image had been formed by manmade means indicated by brush strokes or other artistic techniques. But having eliminated all those possible explanations, speculation about whether it was radiation or some special kind of chemical reaction involving sweat and spices and who knows what else is pointless and fundamentally unanswerable. Besides the Shroud, we have another miraculously imprinted image: the Tilma of Guadalupe. This picture of the Blessed Virgin Mary captured on a flimsy cactus cloth garment now over 500 years old also defies natural explanation. In the miraculous, of course, God can do anything. So, old friend, it was good to hear from you. But do yourself a favor and do not be deceived by the likes of Marcus Borg and the other members of the infamous Jesus Seminar whose falsehoods can best be described as the work of Satan, N.T. Wright’s friendship notwithstanding. How about one more posting Dan? Suggestion: draw up a list of prominent Shroud busybodies (hopefully myself included), maybe 10-20 in all. Challenge each to say what they would do if provided with an image fibre or two from the Turin Linen. Their obligation as ‘opinion-formers’ would be to test the one or more ideas they have proposed for image formation. In other words, are they able to function as scientists as well as would-be opinion formers? (That’s recalling the essence of science, namely to put forward and test hypotheses, ideally making a prediction when they feel sufficiently confident). I personally would be more than happy to be confronted with the above challenge. I would not put myself in the class of “prominent Shroud busybody” since there are undoubtedly many participants with more impressive scientific credentials than I have. But I can easily respond to Colin’s challenge here. If I had access to a Shroud fiber large enough to carbon-14 date, that is what I think should be done immediately. That might put an end to the endless debate about the vintage of the cloth itself. If it is shown conclusively from such a test using the original Shroud threads that the cloth originated in the middle ages, then end of speculation about whether it covered Christ’s body. It would still have value as a work of art depicting the effects of crucifixion as described in the New Testament, but could not be put forth as the actual burial cloth of Jesus Christ. Of course, if the carbon-14 dating put the age of the cloth within the lifetime of Christ, then the claims for its authenticity as the actual burial cloth would be powerful, indeed. Skeptics could still argue that the image was formed by human hands on an ancient cloth but the argument would be much more difficult. Nonetheless, it would be made, let’s be honest. The problem here is not science versus unsupported opinion as Dr. Berry seems to think. The problem is that science can go only so far in explaining the universe. It is valuable and dependable in explaining how the universe functions but has nothing to offer on the bigger questions of where the universe came from, why it operates like it does, and the existence of other components of the universe not physically detectable in the one we live in. But atheistic scientists reject these questions as beyond the purview of of mankind. They do not want a universe where God is the master Intelligence and Creator. To the extent that they have all the answers to the universe we live in, it is easy to shrug and agree to “move on” since the other questions are not susceptible to such demonstrable proofs that one has to accept them or be labeled a fool (even if some of us “busybodies” might be tempted to do so anyway). However, science does not have all the answers even to the universe we live in. In fact, it has a stunningly low percentage of answers–something in the range of only 4-5 percent. “Dark energy” and “dark matter” make up the rest of the observable universe. Science has no explanation for these. Further, quantum physics is understandable in the mathematics that reveal it, but not in the “spooky action at a distance,” as Einstein put it, whereby paired particles respond simultaneously to a single stimuli even if separated by millions of light years. Nor does science really understand how light and electrons can be “nonexistent” until observed whereupon light converts from wave to particle and electrons convert from a probability of existence to an actual existence. Finally, string theory revolutionized cosmological science and revealed in its mathematics that there must be multiple universes of some kind. Those of us who believe in God as master Intelligence and Creator are not troubled by these scientific revelations. We already know that there is at least one supernatural dimension because Christ appeared and disappeared from and to it after his resurrection. So, here’s where we are regarding the Shroud. Scientific study is valuable to determine whether it could be a manmade artifact. The very nature of it (negative, faint image instead of the vivid details of its “negative” image and findings from the John Jackson group study) points away from being a human creation. But, there are other tests that could be done to move the needle a bit further on this question. If the Shroud is determined to be scientifically inexplicable, then I think further analysis and speculation trying to determine how the image was formed are pointless. If God is the artist here, we will not uncover the method by which He formed this image nor would it be relevant anyway. There’s my two cents worth, Colin and Dan. You only need 9-19 more per Colin’s suggestion. One of my favourite books is The Seven Basic Plots. Why We Tell Stories. By Christopher Booker, one of the founders of the satirical magazine Private Eye, it is a heavy tome with a big message. In short: the plot of every story, every book, every opera and film ever made can usually be simplified into one of seven structures. There are stories like Dracula, The War Of The Worlds or Star Wars, which are all about “overcoming the monster”. There are “rags to riches” tales like Cinderella or Brewster’s Millions; there are “quest” stories like The Odyssey or the Lord Of The Rings; there are “voyage and return” stories like Alice In Wonderland or The Hobbit, and so on. Booker’s point (and in this he borrows from psychologist Carl Jung) is that whichever civilisation we come from, however connected or disconnected we are from the rest of human culture, our species seems to be irretrievably drawn towards narratives. We see the world in terms of stories and narratives. That’s the way our brains work. We have an instinct for form and order, whether that is mathematical form, musical form (human beings have an appreciation of music which far outstrips any other species) or narrative form. And it doesn’t take an expert to understand why: the world is, by its nature, complex and frequently flummoxing. We are on a planet spinning at 1,000 miles an hour around a ball of hot gas travelling through an infinite universe. We are constantly assailed by chaotic forces, be they natural disasters or other misfortunes. We are all at risk of being struck by lightning or a meteor. If one spent all of one’s existence pondering this chaos you might never want to leave the house each day. Narratives are one means of bringing this chaos into a sort of order. When you think about the world in this way it’s possible to trace so much of fundamental human history down to this narrative instinct. What is religion if not a narrative and structure with which to make sense of the world? For all that it is an evidence-based discipline, is not science also a means of contextualising and ordering the chaotic physical world around us? Squint a bit, and you can see narratives everywhere. Our determination to see the world in terms of stories has helped humankind to become the most successful species ever. Yet it also brings with it some pitfalls. Narratives are by their very nature a simplification tool. There is a beginning and an end; there is cause and effect; there is a limited cast of characters driven by a limited range of emotions and instincts. But the real world is rarely actually like that. So while boiling down the world’s events into a simple narrative might be pleasing to our prefrontal cortex, all too often it tends to underplay the complexity of what’s really going on. Not every event is as complex and multifaceted as these: there are plenty of straightforward narratives in the news these days. But most of the political and economic stories we deal with on a day-to-day basis are so complex that they defy simple narratives. Or, more accurately, they allow us to spin multiple, contrasting stories about them. Then again, twas ever thus. The big difference these days, it seems, is that so many people seem unwilling to see the world through every prism except the one they prefer. Can I have one image-fibre and one non-image fibre on the same slide? I think a comparison could be the most useful thing I could do with them. Noun: a consideration or estimate of the similarities or dissimilarities between two things or people. Noun: a supposition or proposed explanation made on the basis of limited evidence as a starting point for further investigation. Noun: a thing predicted; a forecast. It’s fine as far as it goes, certainly for the working scientist, departing the central comfort zone, entering that oh-so-challenging, oh-so-fulfilling intermediate creative zone, deploying repetitive and systematic hypothesising and testing, attempting to stay clear of the outer red danger zone. But it doesn’t reflect the real world. Why not? Because no man is an island, least of all a scientist like myself, one who has reached the point of arriving at Major Conclusions, making Predictions, announcing them to the world at large. (It’s the end-stage of what we scientists do, or try to do). “Go figure” (as you Americans are admirably wont to say, by way of shorthand). So, Colin, you seem like a very reasonable guy and I really have no issue with anything posted above. In fact, I am a person who agrees that where science and religion conflict, religion must give way because science deals in facts. Also theories, of course, which is where a lot of the religion/science conflict takes place. To the extent that my comments have been deemed personally hostile to you, I apologize because I can get worked up by the arrogance of scientists sometimes. Regarding the Shroud, here is how I see this issue. Science has a definite role to play in assessing the archaeological value and significance of this cloth. Religion also has a role to play in assessing whether this cloth fits New Testament descriptions and can be legitimately regarded as at least an accurate portrayal of the sufferings of Christ if not the actual burial cloth itself. Of course, it is an almost irresistible tendency to conclude that it is the actual burial cloth because of the power of its image and the mystery of its formation if science cannot rule out that possibility. The problem comes when the topic is discussed by partisans for either view that have no tolerance for the other side. Thus, scientists who reject the existence of God and/or the possibility of the physical resurrection of Christ search for anything no matter how minuscule to support their case. Similarly, although it does not come into play so much with the Shroud, many religious believers reject the findings of science because they conflict with biblical assertions about the geological history of the earth and other topics. Partisans from either perspective have little or no patience for those on the other side of this divide and often express their opinions of them with contempt. It’s a symptom of the fundamental flaw in mankind: pride and its personal identity, ego. And, let’s face it, hostile partisans from one extreme or the other drive people with the opposing view of the universe toward equally strident responses. I commend you, actually, for your temperate responses to some of this provocation. In my comments on the Shroud, I have tried to weigh the history and physical evidence produced to a reasonable conclusion regarding the cloth’s being either a manmade creation or an authentic byproduct of a divine event (the resurrection). I have read but had little patience with the scientific speculations regarding radiation, some kind of chemical reaction, or even a unique result involving spices, light, atmosphere and who knows what else in the tomb where Christ was buried. Unless a replica cloth using these techniques is produced, they just sound to me like scientists desperate to explain the Shroud without admitting it could have been formed by a supernatural power. I wish you well, Colin, wherever you may live (NZ?GB?). I can see why Dan likes you. We would probably get along pretty well, too, although I suspect the Shroud would not be a frequent topic of conversation. Near death experiences would probably be off the table, too, although that is a subject for another blog. In it, you used the term ‘optometrist’. I took that to mean you weren’t a Brit (we generally say ‘optician’) and were most likely American. So when I said in the previous comment that I was at odds with a ‘fellow Brit’, attempting to portray me as a good-for-nothing charlatan, rest assured it was not you I had in my sights. Yes, I remember the “flour” exchange. Well, by now, we both understand that we are coming at the Shroud question from opposing ends. And I was intending to add to my previous comment that while I agree with the wiki circles approach, the devil is in the details, so to speak. We would fill in those circles quite differently. For the record, I can understand why scientists may have a particularly hard time with religion. It is difficult to reconcile the vast size and complexity of the universe we live in with the notion that it was created and is maintained, in some sense, by a Being that we can also call “Father.” And certainly the example of large numbers of people claiming to have religious faith but exhibiting clearly that they do not understand it nor practice its tenets is quite off-putting. But I believe the scientific method, or at least a critical, objective analysis, can be applied to faith issues in many ways. I’ll leave with one example. St. Thomas Aquinas was probably the most brilliant theologian in history and one of the most brilliant minds also. Yet he reported after experiencing a revelation of the afterlife, not long before he died, that based on what he had seen everything he had written was as “straw.” He didn’t write another word. His testimony is just one drop in a very large bucket. Peace. At least you don’t have Trump over there to contend with. Anyway, thanks Dan and other ideas-friendly folk , on or off this site with its remarkable exploratory, largely free-floating history. For my part, I’m now pulling out of research on the Turin Linen. (I have other interests, notably Stonehenge and other Neolithic additions to the British and other landscapes). 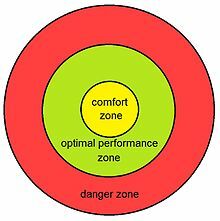 That interesting wiki graphic on the Comfort Zone was heaven sent (oops|) as a vehicle for hinting at reasons! Body image chromophore will be found within SCW cores , assisted but not proven by my underlying model (No. 10, flour-imprinting 2015 vintage, tried and tested as far as seems currently possible with limited home-based facilities). It’s unlikely there will new postings on my own site, bar a total change in sindonological climate, with some receptiveness at least to science-based sceptical thinking etc. But I’m still there (as well as here on Dan’s site for as long as its present hugely welcome resurrectional phase continues) to respond to comments. The ball is now in pro-authenticity sindonology’s court – not mine…. Incidentally, folks, there’s another serious discrepancy between what I see in my Model 10 cross-sections (which may or may not be relevant or valid, though I happen to think they are) and the schematic diagram shown in that 2010 SSG review. (“schematic”, note, not a photomicrographic cross-section to be seen anywhere – why not?????). Note that in Model 10, one sees image fibres throughout the entire cross-section. Compare with the Fanti et al schematic where they are shown on the periphery only of both warp and weft threads. It’s not my intention to force further ideas onto this posting, but if there are open-minded folk (as distinct from myopic custard pie tossers who henceforth will be ignored) interested to hear that explanation of mine right here, they have only to ask. Yes, I’m having to stick my neck out somewhat on this one, but that’s science-bizz for you. Things are not always what they seem at first sight. One has to probe beneath the surface (literally!). While I don’t doubt for a moment that the PCW is transparent, that does not mean that the interior of the SCW is guaranteed to be on full display – as an absurdly simple experiment demonstrates. Lay a black cotton thread on a microscope slide. Then place a partly unspun linen thread across it at right angle. Then put a cover slip on top, and view under the microscope, using either above or below-stage illumination. All it takes is a single linen fibre to blot out the underlying black cotton, despite the latter being in physical contact. That’s true whether one focuses on the linen fibre (left picture or adjusts the focusing wheel ever so slightly to focus on the cotton thread. What price total transparency, total visibility of the SCW and its contents (with entrapped image chromophore?) given the extraordinary optical properties of linen fibres? Best to make no assumptions whatsoever about linen fibres. They have an extraordinarily complex internal architecture with those longitudinal arrays of microfibrils and surrounding gaps, one capable it would seem of playing all kinds of trick with the light, whether by reflection (including total internal reflection?) or refraction, more probably a complex interplay of the two. Good to see shroudstory active again. I bring sad news unfortunately. Yannick Clement and John C. Klotz have both passed away recently. Yannick was only 45 years old. He and John contributed intensely on this website and they will be missed. I bring my sincere sympathy to their families and friends. I don’t know if you (or other visitors to Dan’s site) were aware, but the articulate Stacey Reiman of the Alaska Shroud Group produced a listing of those most prominent on Dan’s site, up to Dec 2015. (Bloggers like myself also get credited numerically speaking with what they have generated on their own sites, if I’m not mistaken). You are 34th in Stacey’s listing, with 178 comments! So what’s your take, if any, on current controversy? Thanks for your kind message , for the info and for remembering me ! I wasn’t aware about Reinman’s listing and I find that interesting. Concerning the Shroud, I note that you are still studying this subject despite incessant hostility from most “shroudies”. I prefer not to write anything more concerning this matter. I will travel to U.K next year and will be interested to have a chat with you if possible. I will send you a private message about this. I look forward to meeting a kindred spirit (?) and your views on the chief spokespeople (correction: non-spokespeople!) for mainstream pro-authenticity sindonology. Suffice it to say I am massively unimpressed with the display of non-communication exhibited thus far (especially as the majority are signed up to the so-called “Shroud Science Group”.). Science? Ha, ha! Yes, let’s meet up when you’re over. Central London (for mutual convenience)? I discovered the amazing Blackfriars Station mainline station (not Tube) the other day, with platforms extending the complete width of the Thames, with fantastic views of all the new architecture (shame the Gherkin is largely obscured by new additions). There’s a fantastic historic and quirky wedge-shaped pub nearby called , guess what, “The Blackfriar”. Expect to be treated to a drink of your choice . The grub and general atmosphere are good too. Three weeks ago I placed that list of 17 ‘ticks in boxes’ , favouring my Model 10 (flour imprinting/ second stage roasting) up on my own site. I offered to reproduce them here should anyone be interested. (No takers!). So it’s somewhat galling to see the earlier suggestion here on this now fizzling out thread that the list has still to be produced! Here then is a copy-and-paste, simply to cover myself against the suggestion that I am/have been leading people on. (Not so, not my raison d’etre, namely experimental hands-on model-building as a means of rooting out the FACTS!). 2. Image responds to 3D-rendering software. 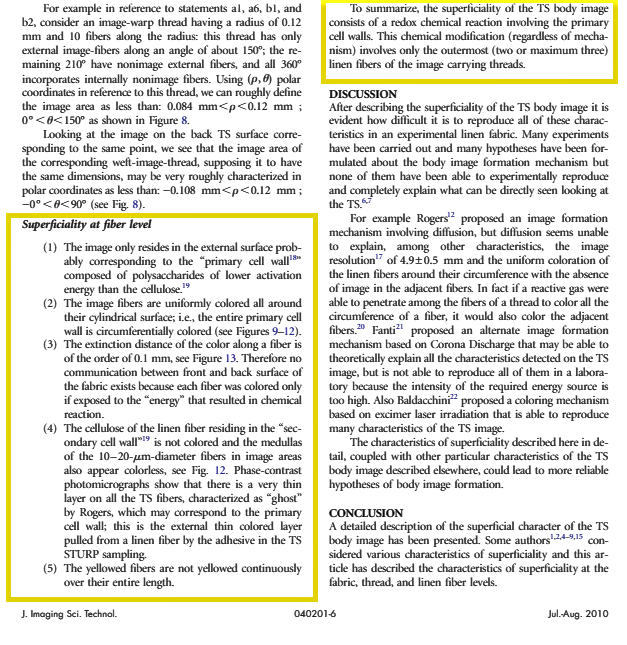 (But then so does any image that has steps or gradations of image density, that claim for so-called “unique encoded 3D characteristics” of the TS image reflecting failure to run proper controls). 3. Image colour. (Any shade one wishes between faint yellow and dark brown, depending on how long one roasts the Model 10 flour imprint). 5. Directional image characteristics (frontal v dorsal images only, lacking sides or top of head), reflecting a desire on part of medieval artisans to achieve an imprinted look, assured by sprinkling of imprinting flour from above, and pressing linen against flour coated body from above). 7. Ease of bleaching colour, e.g. with alkaline hydrogen peroxide, which works on both the TS image fibres and those from Model 10. (‘Bleachability’ fits with Rogers’ proposal that the image chromophore is organic in nature – more specifically a product of sugar/amino Maillard reactions – which should by rights have immediately ruled McCrone’s inorganic iron oxide paint pigments out of contention). 8. Image non-fluorescent under uv (and indeed tending to quench any fluorescence from the linen itself). 9. Water-resistance of image. (The final Model 10 image is that which remains after vigorous washing of the imprinted/roasted linen with soap and water, the image chromophore appearing to be well and truly incorporated within the threads and fibres of the linen). 10. Image durability. (The Model 10 imprints made back in mid-2015 look as good now as they did when freshly prepared). 11. Aged look of background linen – non-image areas – could well be a consequence of colour-development of a flour imprint by ageing. (Even a well-known proponent of authenticity has stated that the colour of the linen is more consistent with effects of heat than genuine ageing). 12. The well known “poker holes” might well be a non-intended result of roasting the flour-imprinted linen over glowing red-hot embers. 13. No obvious signs of imprinting with a (conventional) liquid medium, such as capillary migration , and readily explainable if the imprinting medium were a powdered solid, albeit onto wet linen. 14. However, claims for a faint reverse side image , at least for head and hands, can be accounted for. (Think a briefly liquefied chromophore, exuded from heated white flour, penetrating the cores of linen fibres, able to traverse the width of linen, appearing faintly on the opposite side. 15. Apparent image superficiality (at least for those who have not bothered to look at cross-sections of image fibres under the microscope). A highly reflective primary cell wall may well prevent one seeing image chromophore that has penetrated the underlying secondary cell wall, subject of the current posting, at least when viewed under the microscope with intense illumination. 16. Peculiar microscopic properties of the TS body image , e.g. so-called half-tone effect, with all image fibres of same intensity of coloration, image discontinuities, striations etc. (These can be accounted for, at least in principle, if it is assumed that the image chromophore is initially in a liquid state, penetrating and colouring the interior of image fibres, able to migrate a short distance only before turning solid – Rogers’ proposed final melanoidins being of high molecular weight. 17. McCrone’s “microparticulate” image chromophore , misidentified as an inorganic artist’s paint pigment, specifically iron oxide, can be accounted for in Model 10 by assuming that the end product of Maillard reactions in the heated flour imprinting medium are the melanoidins proposed by Raymond Rogers. 18. Starch contamination. Rogers claimed there was evidence (his own? others’?) for traces of starch contamination on the TS, supporting his ‘starch impurity’ hypothesis. Washed Model 10 imprints also show tiny sparkles of reflected light, which might well be starch granules derived from the flour imprint, while noting that there may well be enough free reducing sugar in white flour to generate Maillard reactions without needing to invoke breakdown of starch to reducing sugars. At some stage, I must look out the complimentary things that Thibault Heimbuger MD (and the perceptive and equally appreciative David Goulet) had to say some 3 years ago about my Model 10, before that heavyweight French MD disappeared off the scene, for reasons that remain a mystery. Does anyone know why TH disappeared so abruptly having been so active, indeed combative for so many years (and a co-author incidentally on that now highly questionable, 2010 Fanti et al SSG review? ).